Perhaps no staple article of food is more the subject of strange fancies or more misunderstood – more overpraised for qualities which it does not posses and blamed for defects not its own – than that standby of the corner fruit stand, the banana. In spite of prejudice and misunderstanding, however, the majority of people accept its worth, for the consumption of bananas has increased by leaps and bounds. Less than fifty years ago the first bananas were brought to Boston. Today it is estimated that seven billion are consumed annually in the United States – an average of six dozen of this fruit for each man, woman, and child in the land. Do not chose bananas that look pretty rather than those that are ripe. The banana of a clear lemon-yellow color, which brings the best price in the market, is most certainly not yet a ripe fruit. The pulp of such a banana is composed very largely of starch, and while it is an exaggeration to say that it is as difficult to digest as the starch of a raw potato, it is greatly improved in this respect by permitting the ripening processes. When the banana is perfectly ripe, the clear yellow peeling has changed to brown or black, and more of the starch in the pulp has been converted into sugar. Such bananas have a far better flavor and aroma than the unripe yellow fruit. Whatever bad reputation the fruit has acquired as regards to its indigestibility is due, undoubtedly to the fact that many people eat the unripe fruit. Then there is the tendency to eat the whole banana quickly without sufficient mastication. Nature has given us in the banana a sanitary, sealed package. The banana is cheap; when properly ripened it is easy to digest; moreover, it contains sufficient roughage and laxative properties to be free from the constipating tendency of which many highly concentrated modern foods are guilty. Its flavor is bland and characteristic, yet not sufficiently pronounced to become tiresome. So have I. “Unripe” bananas work for me. Here all this time I thought the green bananas were the ones not ripe🤔. Lol, Never realized that bananas were considered to be unhealthy. As a child I loved them( except in my school lunch box for then everything tasted like banana) and still do. Bananas have grown on me over the years. Maybe I didn’t like them when I was a kid because of the school lunch box thing. They don’t have very many calories, do they? If I had a choice between a banana and a large cookie, I’d guess that the banana had fewer calories. They’re probably right. Bananas are sweet. I didn’t realize that people in North America ate bananas regularly (or semi-regularly?) a hundred years ago. I can’t stand the texture of bananas when their peels get brown and mushy, though, so I’m not going to be taking this writer’s advice. Those kinds of bananas are only good for banana bread in my opinion. Haha! I also was surprised that bananas were widely available in the US a hundred years ago. It’s interesting that some modern writers question whether bananas are good for us. I always thought that we were supposed to eat bananas because of their high potassium content. This brought to mind my Aunt Flo who use to make giant banana splits. A carton of ice cream was only good for about four of her splits, five if she was making small ones. Boy were they good. mmm. . .On this hot summer day, I want one of your Aunt Flo’s banana splits. That was amusing. I’m the left-over banana person in our family. The others eat them only if they are green or light yellow. Anything beyond that is left to me to dispose of, which I do, using them in breads and desserts. For the sake of our health, I’m glad we usually eat them all before they degenerate into sweets. When I was a kid there was a running debate in our household about whether bananas that were still a little green, or ones with brown flecks, were better. My father preferred the less ripe ones, while my mother liked the very ripe ones. It’s amusing the lore that follows certain fruits. Thanks for sharing this, It’s interesting to read what they thought of bananas back then. I’m glad you liked this post. I also thought that the hundred-year-old article was very interesting. Wow, that is a lot of focus on such a staple of today. It’s funny how different our diet is today now that we are such a global people. I agree – The hundred-year-old article made it sound like bananas had recently shifted from being an exotic fruit to a more mainstream one. Well, I guess even there there was a debate about what was good for us and what was not. So far I have not read anything bad about bananas today. I prefer mine firm. It’s amazing, both then and now, how much time people spend thinking about which foods are healthy foods. Interesting to read about banana consumption a hundred years ago. I wonder what varieties were popular back then. I wonder if more varieties of bananas were available back then. I vaguely remember reading somewhere recently that only a couple varieties of bananas are sold commercially – and that some of the sweetest, tastiest varieties are very rare. In New Zealand the bananas used to come from the Pacific Islands. I don’t know what the variety was but it was certainly sweet. My grandparents ripened the bananas by putting them in a paper bag in the warming cupboard. Most bananas in the U.S. come from Central America – and, in general, they all seem like they are the same variety. Occasionally, I’ll see a very small type of banana which is sweeter than the ones which are regular-sized. My father loved bananas! But late in life his potassium levels were too high and the doctor told him to stop eating them. He was very unhappy about that. My granddaughter is very fond of her mother’s banana bread. It’s hard when someone can’t eat the foods they love because of health concerns. This cleared up the banana issues touted by the mini videos all over the internet. Solved in 1917. How about that?? Great information, thank you so much for sharing. It’s nice to hear that you liked it. The perfect banana for me is one that’s just developing its little brown freckles. Once it gets too soft, it goes into a smoothie. But here’s an odd fact about me that I can’t explain: I can’t get in the car for a trip (day trip or otherwise) without having a stash of bananas. I suppose it’s because they’re easy to eat. Here’s another tidbit: sailors and other boaters believe having a banana on board is bad luck. There are some fishing guides and charter captains that won’t allow a banana on their boats. On the other hand, I learned how to calculate a boat’s speed through the water using a banana peel. Drop it off the bow, calculate how long it takes for the stern to pass it, and do the math. How cool is that? Your comment bring to mind those old math problems that we did in elementary school about a boat going X miles per hour against a current going Y miles per hour in the opposite direction. Black is how we ate them, but I think price had more to do with it. 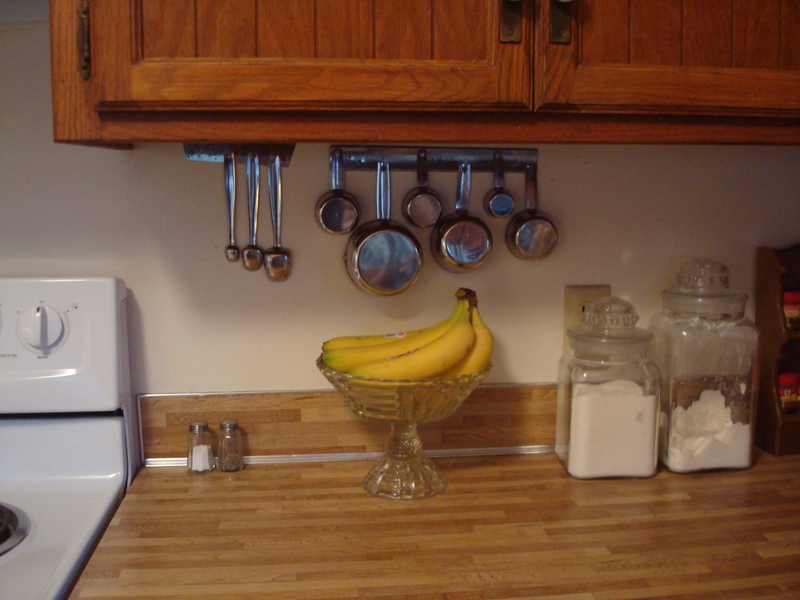 Over ripe bananas were usually on the clearance table for 10 cents/lb. Can’t eat then like that now, although my dad still does. I’m sure glad they don’t turn to poison when combined with milk! So am I. Bananas are delicious with milk.